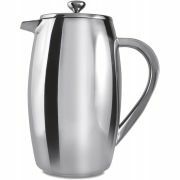 This stainless steel french press from Grunwerg has a double wall insulated structure that keeps the coffee hot for a longer time. The stainless steel body is also a more durable alternative to glass french press coffee makers. Three different sizes available: 350 ml, 800 ml and 1 liter. Put the ground coffee in the pot and pour the hot (92-96c) water in the pot. Let the coffee brew for 3-4 minutes and after that press the ground coffee down with the plunger. Use 6 grams of ground coffee for every 100 ml of water. 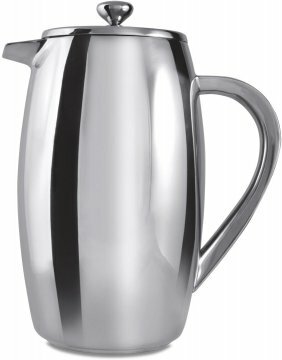 Use a coarse grinding, preferably slightly coarser than the drip brewer grinding.